For those who don’t know, I got married recently. And a wedding traditionally is followed by a honeymoon. We went to Bali. Bali is an amazing place. The culture and the country are very different from the UK so much so, that I could write a book on it. However, right now, I want to talk about the traffic. I consider myself a good driver. I’m a confident driver and I’m pretty experienced, having been driving since I was 17. But I would honestly not rush to drive in Bali, because I’m not sure I’d cope very well. This is because the attitudes of drivers are very different over there. Over here, we have strict rules of the road. We follow them to the letter and we frown on those who don’t. If we do break them (for example undertaking a middle lane hogger on the motorway) we sneak through slightly guiltily. If we see rule breakers, we glare, curse or even beep our horns. The upshot of this is that vehicles weave across the road, they overtake into oncoming traffic, which kindly slows down to let them get back in. Scooters and bikes squeeze round cars and cut in front of other vehicles. Everyone is very close, but somehow I never saw 2 vehicles touch. My only conclusion to this is that they have a greater awareness of everyone else on the road. They also drive much more slowly than us. This is probably mainly due to the traffic volumes out there, but also going more slowly enables you to respond to what’s going on around you. I never actually drove in Bali, but I did do an experiment on foot during the buffet breakfasts at the hotel. The serving area could be entered from various directions and at times the place was pretty crowded. So the movement of people around the area could be compared with a busy traffic junction. I noticed that if I walked fairly slowly around, I could preempt other people’s movements and avoid heading into their path. I could slightly slow down or speed up to avoid a collision but keep moving at the same time. If, however, I tried to walk at my normal, British pace of rushing around, I’d have to suddenly stop or swerve to avoid running into another person. This could be difficult, especially if I was carrying a hot pot of tea or a plate full of food. Slow was serene and graceful. Fast meant I was having to react all the time. If I’d continued with fast walking, I can imagine I could have become frustrated with people who I perceived as “in my way”. This got me thinking about life and how we live it here in the UK (well probably in most of the western world). Most of us rush around, trying to fit everything in to the time we have available. Many of us become stressed by the little things that interrupt us from our path. If we rush, we can make mistakes which we then overreact to. And, because of our tendency to do this, we worry about future events which may bring more of this. None of this actually gets us to our goals any faster and it definitely doesn’t make for an easier or pleasant process. It’s also likely to negatively affect our relationships with other people. If you are feeling irritated with other people because they are getting in your way, you are more likely to snap or row. A common example of this is road rage, but we also get irritated by queues in shops, waiting our turn to use the bathroom, and equipment being out of order when we want to use it. I know that the extent to which I’m affected by these interruptions is linked to my emotional state at the time. If I’m currently stressed, they will annoy me. If I’m calm, they will barely register on my radar. So my conclusion is that too many of us rush round in our own worlds, with little time or energy to think about those around us. This not only stresses us but also isolates us. My goal, now I’m back, is to move through the world with a greater awareness of other people. I hope this will bring me an improved sense of calm and connect me better to the world around me. 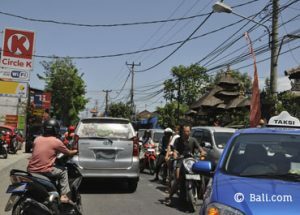 More on Bali’s traffic, including Bali’s Spiritual Traffic Principals can be found here. If you feel you identify with any of the things you've read and think I might be able to help, please contact me for a FREE 15 min phone consultation. Call 01488 608659. To receive my blog posts as soon as they are written, please join my mailing list. Are Your New Year Resolutions a Sprint or a Marathon? Do Your Belief Systems Serve You Well? I’m Always Stressed. Can You Help Me?